PCs warn another NDP government would be a "disaster." Bob Rae releases a report on the humanitarian and security crisis in Myanmar at a press conference in Ottawa on April 3, 2018. 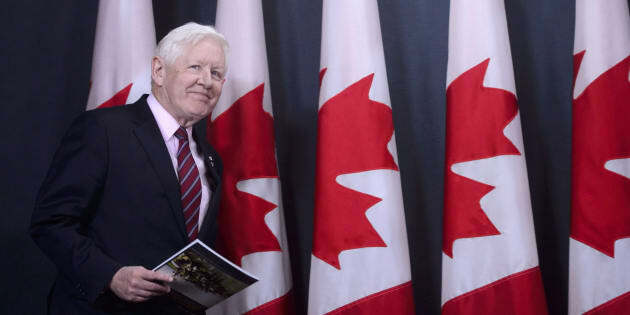 Bob Rae is back. Sort of. With polls suggesting the Ontario election could become a battle between the province's Progressive Conservatives and New Democrats, Rae's record as the province's first and only NDP premier from 1990-1995 is on the lips of Tories. Ontario PC Leader Doug Ford has recently taken to warning the NDP would be "ten times worse" than the governing Liberals, even if the party hasn't tasted government for 23 years. "Let's not forget about the Rae Days," Ford bellowed at a rally in Kitchener Thursday, a reference to how an Ontario NDP government forced public service workers to take unpaid days off to cut costs. Ontario NDP Leader Bob Rae gives the thumbs up sign after leading his party to victory in the Ontario provincial election, Toronto, Ont., Sept. 7, 1990. Ford also noted the lost jobs and "skyrocketing" welfare rates under the NDP's watch, but left out that the party formed government just before a recession. At the second leaders' debate in Northern Ontario this month, Ford said the NDP was a "disaster" in government and "destroyed this province in four years." But NDP Leader Andrea Horwath is always quick to note that since Rae would go on to become a Liberal MP and interim leader of that federal party, she shouldn't have to answer for the choices he made in Ontario. "I'm no Bob Rae in any way shape or form and neither am I going to abandon my party and switch over to the Liberals," Horwath told HuffPost Canada just before the start of the campaign. She has repeated the line on the campaign trail. And it seems Rae will not be in a position to defend himself if his so-called ghost becomes more the focus over the next few weeks. "My appointment as Special Envoy on the Rohingya issue prevents me from commenting on the Ontario election," Rae told HuffPost in an email this week. He is currently advising the federal government on the crisis in Myanmar. If the past is any indication, Rae could be itching to join the fray. In the 2015 federal election, he took exception when then-federal NDP leader Thomas Mulcair poked fun at him during a foreign policy debate. Mulcair, at the time running on a promise not to go into deficit, drew some laughs when he said the NDP had the best track record for balanced budgets of any party in Canada. "There was one exception but it turned out that Bob Rae was a Liberal," Mulcair said. Rae, by then a private citizen, jabbed back on Twitter that he was proud to have lead a government that "re-built Ontario at a tough time." He said it was a "very tired line" from Mulcair and a bit of "recycled nastiness." On Wednesday, the Canadian Association of Former Parliamentarians, a group of former members of Parliament and senators of all political stripes, honoured Rae with a lifetime achievement award in Toronto. What timing. After a tribute video that featured kind words from the likes of Trudeau, as well as former prime ministers Jean Chretien and Joe Clark, Rae took the stage to speak about politics. "I want to start by talking to you tonight about an election that's been very much on all of our minds," Rae began, according to a recording the organization shared with HuffPost. "I'm referring of course to the election in Malaysia, where you may have noticed that the new prime minister is 92 years old... in 2041, I'm ready." Rae, now 69, did not wade into the campaign underway in Canada's biggest province or try to answer any of his critics, but he did joke about what it was like to be premier. "Oh, how wonderful that brief period of time was," he said. Rae hammered home a message that politics is "not to be despised." "It can be as noble as we want to make it and it can be as stupid and as dumb as we choose to make it as well," he said. He addressed those who are still smarting that he changed political parties during his career and view that as a betrayal. "In the end, parties are less important than what we really believe in. What are our convictions? What are the core things we believe in? I know in my own heart that those convictions have never really shifted or changed." He stressed the need for political leaders to be straight with people. "I'm so tired of hearing people say the facts don't matter. Well, you might think that during an election campaign but let me tell you, when you govern, the facts matter," he said. "There's only so much we can borrow, there's only so much we can spend, there's only so much we can tax." And Rae said he was also tired of hearing people say they don't like politicians or witnessing those who belittle the experience of public life. "Let me say to you tonight... my name is Bob. I'm a politician. I am proud of it. I believe in it," he said. "We need good politics and we need good politicians."